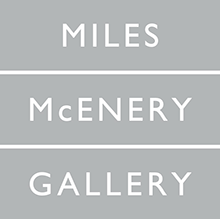 NEW YORK – MILES MCENERY GALLERY is pleased to present an exhibition of new works by Markus Linnenbrink for his fourth solo show with the gallery. A reception will be held for the artist on 7 February from 6:00 to 8:00 p.m. at 525 West 22nd Street and the exhibition will be on view 7 February through 9 March. It is accompanied by a fully illustrated publication, featuring an essay by Frédéric Caillard. Markus Linnenbrink’s energetic, three-dimensional paintings and sculptures are an experience of time and color. In this series of works, Linnenbrink challenges viewers to contemplate the idea of time in art: how a moment may be captured and sustained within an arrangement of color. To create his glossy and brightly colored “drips”, the artist blends epoxy resin with powdered pigments, and then applies the medium to a wood panel over a watercolor-like background painting or an old personal photograph. This process creates a curtain of color that allows Linnenbrink to provocatively invite viewers into the depth of his paintings. The liquid interacts with gravitational force to render vertical stripes over his chosen back grounds. Additionally, Linnenbrink utilizes the nature of this process and transforms the overflow to create other signature paintings. These three-dimensional paintings are made by layering this pigmented resin which the artist drills and carves deep jagged rifts that result in a magni cent geological topography. 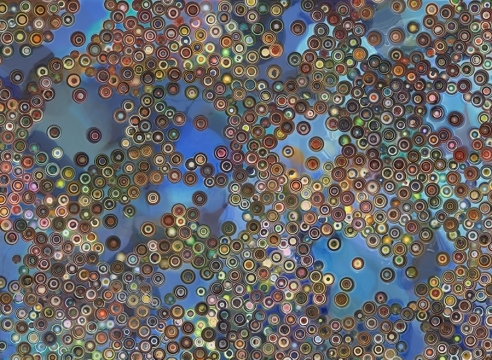 For this exhibition, Linnenbrink also presents “DAYLIGHTTEARSTOMYEYES.” Fusing together acrylic, pigment, and sumi ink on wood and aluminum core, Linnenbrink pushes his installation practice further. Black and white on the exterior–and color on the interior, his “room within a room” is an expansive, three-dimensional work that adapts to both the allowances and limitations of its environment. MARKUS LINNENBRINK (b. in Dortmund, Germany in 1961) attended The Gesamthochschule in Kassel and later the Academy of Fine Arts in Berlin. In 2016, Linnenbrink completed two permanent public installations: an outdoor wall-painting at SLS Brickell Hotel and Residences, Miami, FL, and a series of paintings for 75 Rockefeller Plaza, New York, NY. His most recent solo exhibitions include “THEREAINTNOEASY WAYOUT,” Galeria Maurizio Caldirola, Monza, Italy; “HEREIS TANDKNOCKINGON YOURDOOR, ” Taubert Contemporary, Berlin, Germany; “THEFIRSTONEISCR AZ YANDTHESECONDONEISNUTS,” Wasserman Projects, Detroit, MI; “THEGRASSISALWAYSGREENER,” Max Estrella Gallery, Madrid, Spain; “ THERIDENE VERENDS, ” Pennsylvania Academy of Fine Arts Museum, Philadelphia, P A; “SUNANDWATER” Patricia Sweetow Gallery, San Francisco, CA. Recent group exhibitions include “Abstraction and Architecture,” University of Strasbourg, France; “Abstract Remix,” Taubert Contemporary at New Art Projects, London, United Kingdom; “Deck Voyage,” Borusan Contemporary, Istanbul, Turkey, curated by Necmi Sönmez; “Revisiones,” Galeria Impakto, Lima, Peru; “Off The Wall!,” Kunsthalle Nürnberg, Germany; “Selections of the Cleve Carney Collection,” Cleve Carney Art Gallery, College of DuPage, Glen Ellyn, IL; “3+4 B/W,” Taubert Contemporary, Berlin, Germany; “Local Color,” San Jose Museum of Art, CA; and “ROY G BIV,” Waterhouse & Dodd Gallery, New York, NY; among others. His work is included in the permanent collections of The Hague, Ministry of Culture, The Netherlands; Hood Museum, Dartmouth College, NH; Neue Galerie, Kassel, Germany; NBC Rockefeller Center, New York, NY; Pennsylvania Academy of Fine Arts Museum, Philadelphia, PA; San Francisco Museum of Modern Art, San Francisco, CA; San Jose Museum of Art, CA; UCLA Hammer Museum, University of California Los Angeles, CA; Herzlya Museum of Art, Israel; West Collection, Philadelphia, PA; and Jorge Perez Collection, Miami, FL; among others. 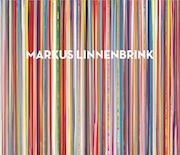 Markus Linnenbrink lives and works in Brooklyn, NY.